A Well-Feathered Nest: The book that shouldn't have been written. The book that shouldn't have been written. When I say that this book shouldn't have been written, I mean that according to today's standards there probably isn't very much demand for a book like this. Have you walked into a Christian bookstore lately? If you've seen the racks of bestsellers there, then you might have an inkling what I'm talking about. Now, I haven't read many books out there on the subject of grief, but just from what I've read in various places and what I've heard in my conversations with others, it seems that the basis of this book would not put it on the bestseller list. I once heard a lady say that when she was going through a difficult time, the last thing she wanted to hear was the words of Romans 8:28. If we are a part of God's flock, then He is actively using every circumstance in our lives to conform us to His image and to carry out the work He has promised to complete in us. He is not helplessly standing by observing as the world twists us and batters us only to determine how He can use those things for good. When we choose to retreat from this or indulge our tendency toward self-pity, then we can easily miss out on the times of sweetest fellowship with our Lord. By seeking little more than to simply "make it through" the hard times, we can miss out on wonderful opportunities to be molded by our Maker. I could go on and on with my opinions about this, but I really just wanted to tell the world how wonderful this book is, and that I think every pastor or anyone who may find themselves counseling a fellow believer through the loss of a child should at least have a copy of it if not read it ahead of time. It is a wonderful insight into the lives of many historical Christian leaders who also walked through this grief in some way. It records intense emotions through their letters, poetry, and hymns while showing how the promise that the circumstances through which they walked were ordained by God to carry out the work of conforming them to the image of His Son shaped their responses to this emotion. 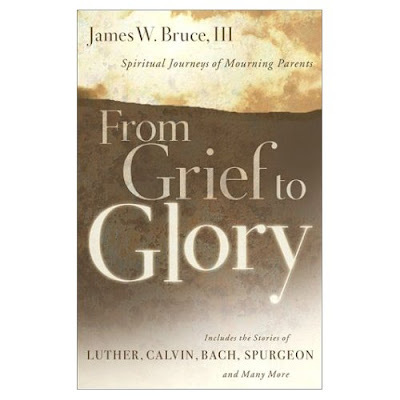 All of these historical accounts and documents are woven together by the author, James Bruce III, who knows all too well the grief of losing his son to a genetic kidney disorder just weeks after his birth. I felt a special connection with him as I realized that he set to work researching and compiling the stories after losing his son. They comforted and blessed him in a special way, and he ended up writing the book I had hoped to find. Personally, I have learned so much and been so comforted to know that great men and women of the faith have walked the paths of difficulty and grief before me. And I am greatly blessed to see how these experiences resulted in their increased faith and caused them to be more like Christ on the other side of the valley. I think these stories were preserved so that we can look back on them much as the writer of Hebrews looked back on the faithful ones he recounted in chapter 11 of his writing. We see the faithfulness of God through the lives of other believers. This is certainly not a fluffy, feel-good book, but it does properly challenge anyone who might be experiencing the same grief not to run away from God. It reassures us of His faithfulness and urges us to seek to be transformed through the experience. The author also points out, through the example of Dr. Robert Dabney how one of the greatest blessings of our grief can be the opportunity to walk with others through their future experiences with familiar emotion yet overwhelming hope and peace. There is so much to be said about the author's weaving of the accounts to portray the progression we may experience on the journey from grief to glory. However, I know that I can't do justice to the book. I'll simply recount a portion of a prayer from the Valley of Vision that has been precious to me and is included in the Prologue in attempt to express something of the pradox of joy in the midst of suffering. I know some of you are getting bored of all the talk with no photos, and we'll see if we can work on that. We've just been a little preoccupied with daily stuff to drag the camera out lately. Then there's all the organization and the fact that I really need to get on the ball with organizing and backing up all the photos I already have and put the EHD to good use. If you're not bored with the talk, then you really should check out Justin's post on a topic that's really been bothering me lately. The Biblical Distorter... umm I mean Recorder has been all abuzz since the Building Bridges Conference in November, and it's made things difficult for some churches and pastors in our area. We realize that we are truly blessed to be where we are right now and see just how far we have come. Wow...thanks for this post. I, too have often wondered why people don't want to hear, "all things work together..." in times of grief. My goodness, if it weren't for the sovereign plan of an all-knowing God, how could I deal with any of life's hardships? I have a few words to say: You say you are happy with where you are and how far you have come. What about all the people that were in that church for years before you came. You have tried to change what they have believed in all their lives. What makes you think you have all the answers. My bible tells me to learn from the elders, and that would be nice if you young folks would listen a little, instead of trying to ruin good churches. I have a few things to add to address the previous comments. First of all, unless the above poster has been in our church for the last 3 1/2 years, he or she probably has no idea where we are a body or what changes have come about over that time. Also, I am very thankful for those who have been a part of our church from the very beginning and the deep-rooted beliefs they taught about the inerrancy of Scripture. They also set a great example for us in their documented commitment to church discipline and a rich confession of faith. At the foundation, no one has tried to change what anyone has believed all their lives but instead we have sought to faitfully teach truth from the Scriptures they have claimed to believe all along. For the record, I never even suggested that I have all the answers. Any counsel I might give in any situation--no matter what it may be--would have its basis in Scripture. Yet we are human, and we admit that falliability comes along with that. Which is why we challenge our congregation to be like the Bereans and hold everything up to the light of God's Word. Also, although I firmly believe that Scripture calls us to learn from our elders, I have to respectfully disagree with your use of the word elder. I believe it is clear from Titus 1 that elders are men who possess characteristics of maturity who are to be appointed as leaders and teachers of the local church. It is also apparent in Paul's letters to Timothy that age is not the primary determiner of who can be called an elder. He writes in 1 Timothy 4:12 Let no one despise you for your youth... Besides, I'm not sure that many of our great Christian leaders of the past would agree that we have sought to ruin a good church, since we have taught nothing that is not addressed in the New Hampshire Confession of faith which was chosen as the confession of our congregation over 100 years ago. And finally, I am sad that any conversation we might have about your concerns has to be carried out through the screen of anonimity. I think open communication that addresses the facts is much more effective than throwing out negative comments and running. I'd be more than happy to recieve comments and questions at any time directly at my e-mail cawebster79@yahoo.com The last thing I want is for anyone to form opinions based on incomplete facts. I never imagined I'd be accused of ruining a good church by a complete stranger when I commited my life to serving beside my husband, but I am so very thankful that there is only One to whom I have to answer at the end of the journey. I do not want to make a habit of deleting comments, but I will not allow my blog to be used to pass along links which, at best, misrepresent me. I sincerely hope the anonymous poster has spent as much if not more time praying and studying Scripture in an effort to learn about his concerns as he has spent searching the internet. My invitation to discuss concerns via e-mail (or over lunch for that matter) is still open. I have already posted a link to several messages from the Building Bridges Conference on both sides of the issue in question that would serve as a great resource for anyone seeking to learn more. Once again, I will not allow my blog to be used to guide people to a site that perpetuates misinformation.